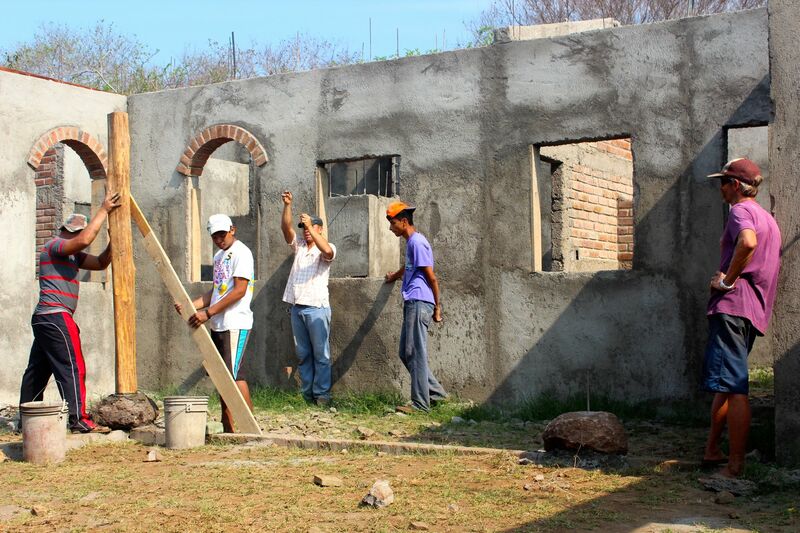 After four months of construction, we have walls completed to roof height, the roof of the bodega is finished, and we’re starting to install the alfajias (rafters) that will hold the roof of the main house. It’s the end of April. The official start of the rainy season in Nicaragua is May 15th, but rain can be expected to begin falling any day now. 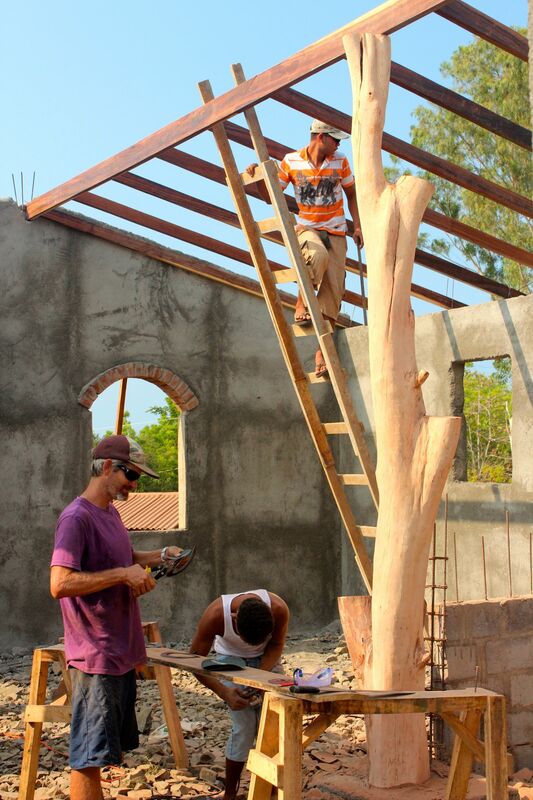 We’re eager to get the roof completed before the rains come! Here’s a selection of photos to show the progress. Curb appeal. 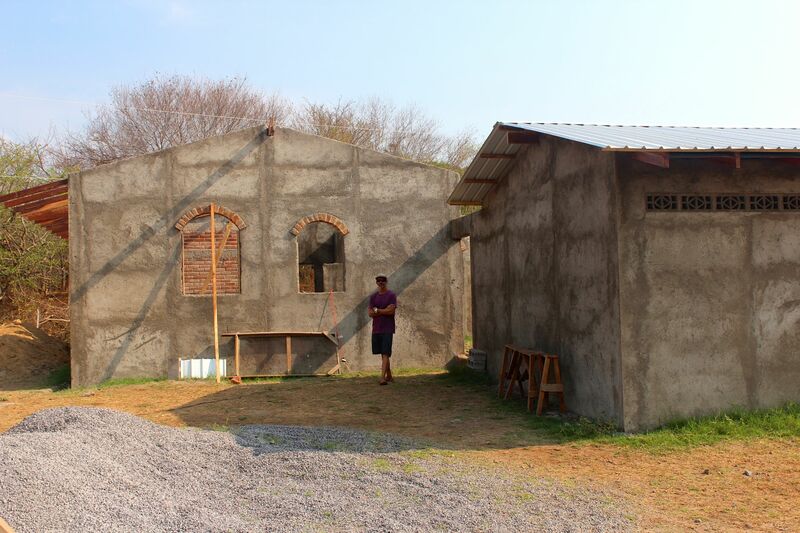 In this photo you can see the bodega/workshop with white metal roof already installed, the volcanic rock wall with space for the gate that will open into the courtyard, and the outer wall of the master bedroom and bath (still waiting for a roof). The smaller brick building with red Nicalit roof visible in the left corner is the caretaker’s house. It hasn’t rained since way back in November so everything is really dry except for the lucky plants situated near the water tank (which is constantly overflowing every time they fill it). This is a one year old, healthy green Asian Guava that is already starting to sprout fruit. Kim has been putting in long hours at the job site overseeing the workers and making sure everything is put together correctly. 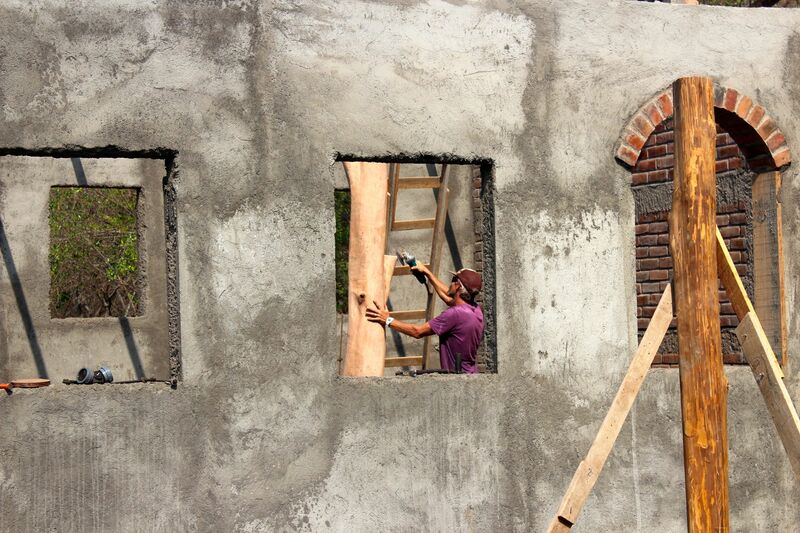 Having a good construction manager is essential in Nicaragua. This is the view of the back/side of the house with the back wall of the bodega on the right, and the back wall of the great room with two arched windows. There will be an iron gate in the space that Kim has just walked through and a big fig tree in the space he’s walking towards, that will help shade the great room from midday and afternoon sun. If you want something done right….. Kim has been getting involved with the finer details. We were able to salvage a large eucalyptus post from a tree that was inadvertently killed during the underground electrical installation. It adds a nice element to the great room. Kim has been busy having it sanded (and in some cases, sanding it himself) to his specifications. This is a look into the kitchen space. The brick wall will support the stove, countertop, refrigerator, and the unfinished block wall will be the kitchen peninsula. The crew has just begun installing the teak posts that will support the roof over the porch. We had ordered “river rock” to place in the patio of the beach house, but the guy with the tractor misunderstood my order and showed up with a load of very large boulders totally unsuited for that particular project. We were able to use three of them here to decoratively support the teak posts. It took an entire day to drill holes in the rocks and install them in place. Fingers crossed we can get the roof on before it rains! This entry was posted in Building in Nicaragua and tagged aposentillo, brisas del alma, building in nicaragua, central america, chinandega, construction management, holly beck obermeyer, kim obermeyer, land for sale, lots for sale, metal roof, northern nicaragua, volcanic rock. Bookmark the permalink. House looks awesome, guys. Wishing you great speed and quality. Love the eucalyptus post!! !